Located less than a mile south of downtown Bar Harbor, George's Dorr's Old Farm property is protected as a small isolated section of Acadia National Park. (George Dorr is one of Acadia's great founders who fought to protect as much land as possible, make it a national park, and he even blazed many of the park's trails.) 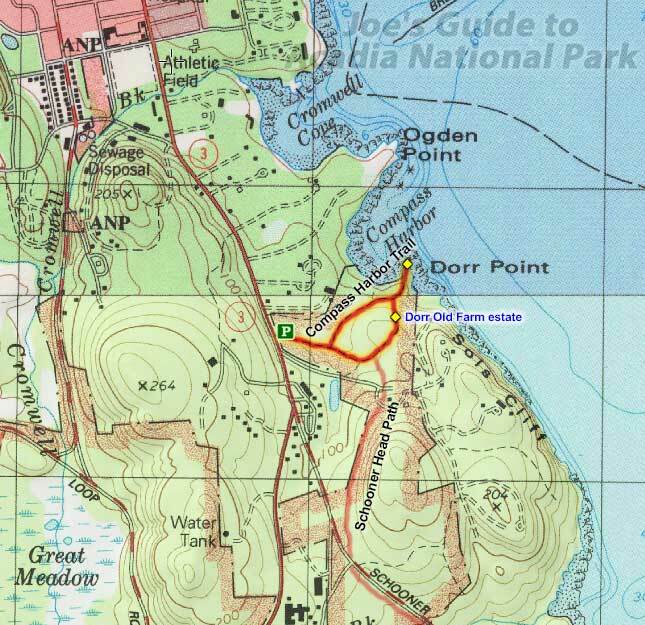 The Compass Harbor Trail is a short and family-friendly walk that heads through the forested old estate and ends at Dorr Point, a granite outcropping that overlooks Compass Harbor and the Porcupine Islands in the distance. The ruins of the Old Farm estate are located on top of the hill above, although only the foundation remains. Access: Compass Harbor Trail parking lot. Length: Roughly 1 mile in and out. Elevation Change: minimal elevation change. The small roadside parking lot is located along Route 3 less than a mile south of downtown Bar Harbor, just north of the intersection of Route 3 and Schooner Head Road. The lot is marked rather subtly, so you have to keep an eye out for it. 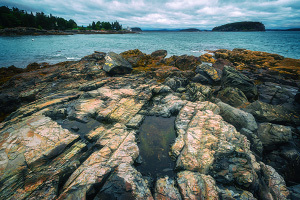 From the trailhead, the Compass Harbor Trail is an easy-to-follow stroll through the woods and soon enough you will be standing on the open granite formations of Dorr Point looking out at Frenchman Bay and the Porcupine Islands. It is fun to explore the coastline around Dorr Point, but a little bit of scrambling is involved. 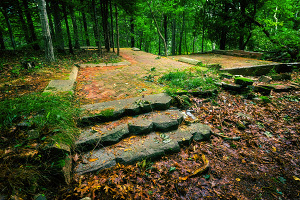 To visit the ruins of the Old Farm estate, when you are back in the forest, look for a faint trail that heads to the left up the hill with several old granite steps showing the way. There is not much left of the house except for the foundation and the patio brickwork, but it is a cool spot to see and explore. It's a bit surprising that NPS has not put a historical marker or other plaque here considering how important George Dorr is to Acadia's history. This isn't a "destination hike" for tourists looking to hit the most dramatic spots on Mount Desert Island, but this is a pleasant stroll through property that tells the story of Acadia's history. I have enjoyed walking here early in the morning and during cloudy/gloomy days which adds to the mood of the experience.